Country definitives from The Queen's Birthday PSB - and maybe a new project! After our break - and processing the fall-out (customer orders) from the Queen's Birthday stamp issue, I have had time to look at the not-so-obvious stamps in the prestige stamp book, the Country Definitives. Many of these are identifiable as singles, detached from their margins, which is helpful for anybody collecting them used. Even if many were not generally for postage used when first issued, sufficient are now on the market for use as postage, that they may well turn up in kiloware or on mail from dealers. Numerical identifies shown are my numbers, although they are based on Stanley Gibbons' GB Concise Catalogue. First issued 14.10.2003 in counter sheets, then in the Celebrating England miniature sheet, both printed by De La Rue in gravure. Some sheet printings had a distinct shade (I don't know the date). The first litho printing was in the 2007 Army Uniforms PSB printed by Enschede. 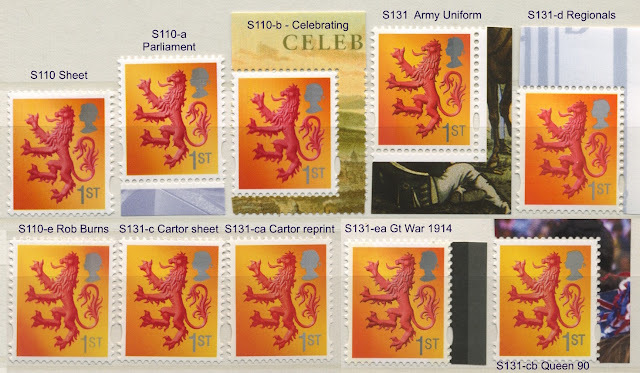 The counter sheet printing switched to Cartor and litho in summer 2012 (philatelic release 3.1.2013), followed by another Enschede PSB (Great War 2014), and the latest Cartor litho printing in the Queen's Birthday PSB. EN7 and EN30 are SG numbers. EN7-a is the DLR gravure sheet shade. Aside from many quite obvious shade differences, the litho printings in Enschede PSBs have 9mm phosphor bands, whereas the others are all 13mm. The two Enschede printings can be distinguished by shade (the Great War being pinker), and both are quite different from the two Cartor printings, which can also be distinguished by shade and degree of definition (the shading is better defined on the latest issue). First issued 14.10.2003 in counter sheets, then in the 2004 Scottish Parliament and 2006 Celebrating Scotland miniature sheets, all printed by De La Rue in gravure. The first litho printing was in the Army Uniforms PSB printed by Enschede, followed by the 50th anniversary of Regional Stamps (De La Rue) in 2008. The Robert Burns MS (2009) was printed by Enschede in gravure, The counter sheet printing switched to Cartor and litho issued 27.6.2012, the 28.6.13 printing being in a different shade. These were followed by another Enschede litho PSB (Great War 2014), and the latest Cartor litho printing in the Queen's Birthday PSB. S110 and S131 are SG numbers. The Scotland stamps provide the fewest distinguishing features to enable identification. Phosphor on the 'Celebrating' stamp (S110-b) has softer edges. As with the England stamps, the litho printings in Enschede PSBs have 9mm phosphor bands, whereas the others are all 13mm. On the other hand the Enschede printing (in gravure) in the Robert Burns miniature sheet (S110-e) has 13mm bands: in addition the head is smaller, and the figure of value is thinner. The two Cartor sheet printings can be distinguished: on our examples the later one (S131-ca) is a pinker shade, but the main difference is that the phosphor on the original is solid, whereas on the reprint it is gradated. This is most obvious on the silver head and '1' of '1st'. And to distinguish the Cartor stamp from the Queen's Birthday PSB (S131-cb) is even easier, as the head and value appear to be grey! This may be an unintended effect of the phosphor: on the Enschede Army Uniform stamp (S131), the narrower phosphor band does make the head seem to be grey under the phosphor, although it is silver. The first litho printing was in the Army Uniforms PSB printed by Enschede, followed by the 50th anniversary of Regional Stamps PSB in 2008 and the Celebrating Wales MS in 2009 both printed by De La Rue. The counter sheet printing switched to Cartor and litho in 2012, followed by another Enschede litho PSB (Great War 2014), and the latest Cartor litho printing in the Queen's Birthday PSB. 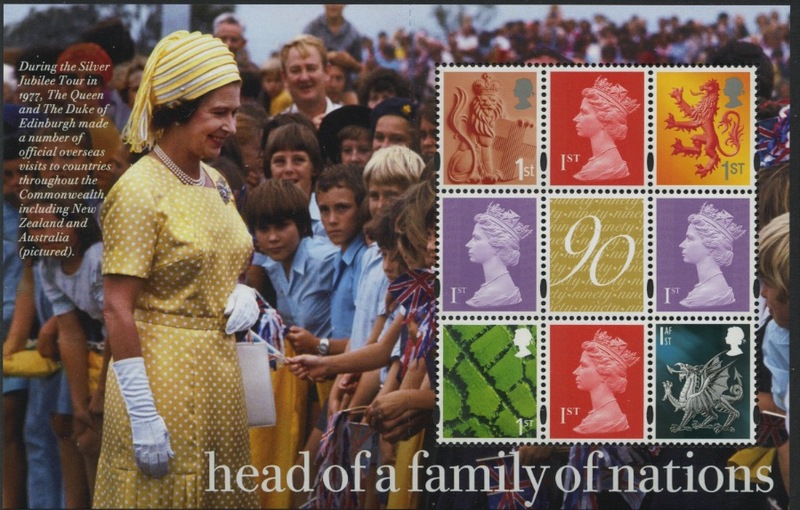 The background to the Cartor sheet printing is blacker, with the are containing the Queen's head almost completely black, rather than shaded blue-green. This applies to a lesser extent to the stamp from the Queen's Birthday PSB, which has possibly the brightest silver dragon of any of the stamps! Northern Ireland is more complex (how many politicians have said that), because unlike the other three countries there is no recognised flag, and so no flag stamp. The Football Heroes and Classic Locomotives PSBs included flag stamps for three countries, but the Fields stamp for Northern Ireland, whilst the NI 'Celebrating MS' included two new stamps showing the Giant's Causeway (a much better design than is used for the 2nd class definitive), and Carrickfergus Castle. First issued 14.10.2003 in counter sheets the Northern Ireland stamps were unique in being De La Rue printed in litho, while the other three were gravure. In fact the only gravure printing was in 2007, also in counter sheets by De La Rue: when the contract for the other three was switched to Cartor and litho in 2012, Northern Ireland was not affected - we don't know of any new counter sheet printing since 2007. 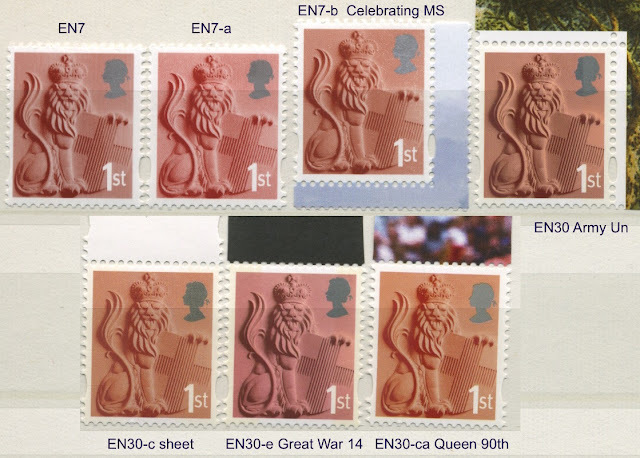 The stamp has appeared in 6 prestige stamp books, starting with Army Uniforms (Enschede 2007), Regionals Anniversary (DLR 2008), Football Heroes (Cartor 2013), Classic Locomotives and Great War 1914 (both Enschede in 2014), and the and the recent Queen's Birthday PSB (Cartor). NI95 and NI123 are SG numbers. At first glance there is little to distinguish these 8 stamps apart from some being slightly more or less yellow, but a close inspection reveals small differences. In the original DLR sheet printing (but not in the gravure reprint), and in all Enschede printings, a micro-printed year appears in black at the foot of the figure '1'. (See illustration.) The year is not clear, but on the Army Uniforms is ©2001 - when the original with no white border was issued. That stamp also has the micro-printed year. As with the England stamps, the litho printing by Enschede in the Army Uniform stamp (NI95-e) has 9mm phosphor bands, as does that in the Great War 1914 book (NI95-eb), these latter being so coarse and thick that you can actually feel the edges! However, the Enschede-printed Classic Locomotives stamp (NI95-ea) has standard 13mm phosphor bands. 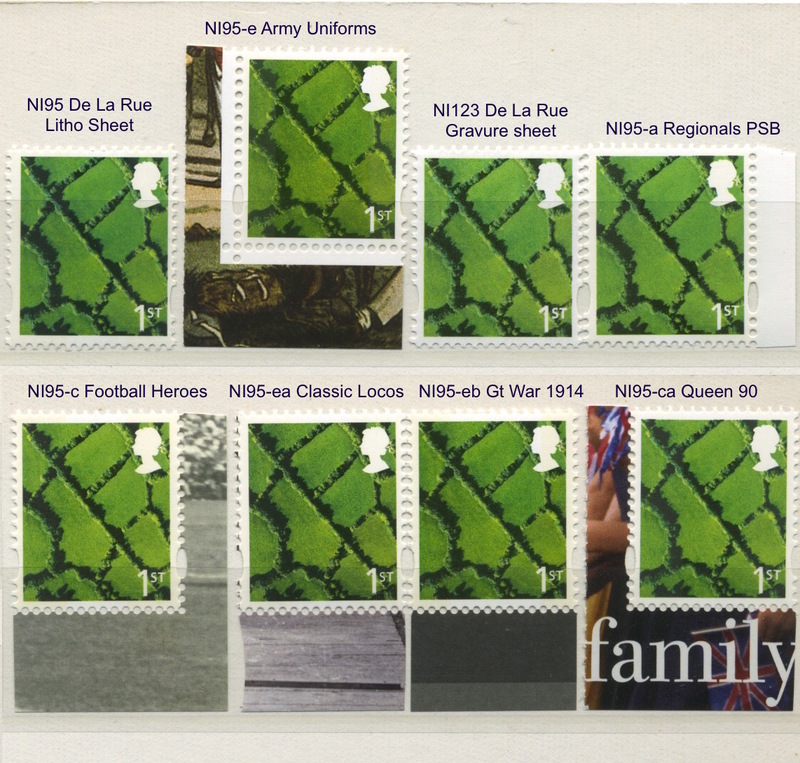 The Cartor-printed Queen's Birthday stamp (NI95-ca) has more solid phosphor bands than their Football Heroes stamp (NI95-c), almost as solid as those on the Army Uniforms stamp. On the Cartor printings the left-most tree at the foot of the design (above the 'i' of family in the illustration above), is touching the edge of the stamp, whereas in all other printings there is a black line separating it from the white border. I hope you have found this exploration of the Country Definitives useful. The 'project' referred to in the headline is to produce an illustrated guide not only to the 1st class stamps but to all the other country definitives which exist in more than one form, and expand on what is in the Gibbons Consise catalogue. As an example, Gibbons' treatment of the 42p values is quite strange. All four were printed by both Walsall and De La Rue when issued in 2005. The Northern Ireland stamps are given separate entries due to shade differences. 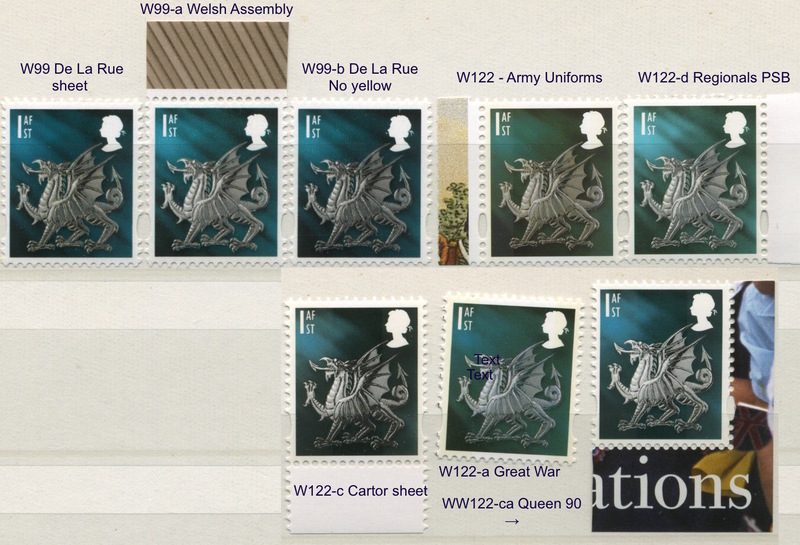 The Scotland and Wales stamps are both shown as being printed by both printers, but the England stamp is only attributed to De La Rue. You can see the differences on our website. Really enjoy these blog entries, thank you. 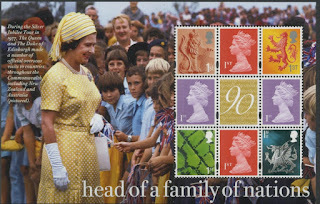 To me, the queen's head in both the EN30 Cartor sheet and Queen's 90th PSB both look grey - same as the Scottish 1st class regional in the QE2 90th. Is that the effect of the phosphor band, or are they really grey where the Army Uniforms (and Great War?) printings were silver? I don't have either of the latter two yet to compare with, so wondering if there may be an EN30a listing in SG shortly in the same way as there is an EN51a listing for the St. George's flag with a grey queen's head.